Persepolis is the glorious remnant of ancient Iran. Imam Reza's shrine is the pride of Islamic Iran. 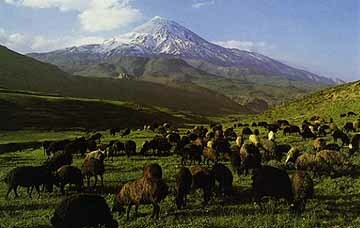 But the ever graceful Mount Damavand is the only Iranian symbol free from the constraints of history and ideology. Empires, governments and tribes have come and gone. Religions have fallen in and out of favor. And amidst all this social instability, Damavand, has been a tower of stability and constancy; our only true, reliable friend. Nasrollah Kasraian, better known for his best-selling photo albun, Iran Sarzamin-e Ma (Iran Our Homeland, Tehran, 1990), has brought together a magnificent collection of images of Damavand and its surroundings. Damavand (Tehran, 1992) is without a doubt the best of Kasraian's several photo albums of Iranian landscape, people and heritage. It is, as its subject, timeless.